Team Suzuki Press Office – March 8. The second round of 18 in the 2015 FIM Motocross World Championship was tough but extremely positive for Rockstar Energy Suzuki World MXGP’s Clement Desalle who took his works RM-Z450 to second place overall at Nakhonchaisri for the Thai stop on the schedule. With his second podium in a row the Belgian also now heads the MXGP standings by nine points over Antonio Cairoli. Team-mate Kevin Strijbos rode to fifth place in front of 24,000 spectators. Sweltering humidity and temperatures hitting the high 30s were typical hallmarks of the third Grand Prix of Thailand and the inland setting of the Thailand Circuit (60km west of Bangkok and a contrast to the previous venue of Si Racha close to the coastal town of Pattaya). The new MXGP course was largely flat and compact and therefore filled with a variety of features that ensured copious air-time for the bikes and riders. Desalle opened the weekend brightly with the fastest lap in Timed Practice and a decent performance in the Qualification Heat on Saturday to secure second choice in the gate. Two lively starts continued the momentum on Sunday. He had no answer to Ryan Villopoto’s speed in the first race and cruised to second place, trying to conserve as much energy as possible in the intense heat. In the second moto he was able to harry Cairoli in the formative stages and when it was not possible to catch the Sicilian - Desalle also had a problem with his goggles when a stone hit the lens and knocked some dirt inside - defended his margin over Villopoto and was virtually faultless. From the first four motos of the year he has yet to finish lower than second. Strijbos felt an improvement with his right wrist compared to the discomfort he suffered in Qatar last week. The Belgian took to the gate in 13th after an eventful qualification on Saturday. In the first moto he was able to circulate as high as third after Tyla Rattray and Gautier Paulin collided and eventually crossed the finish line in sixth. His start was a little lacklustre in the second race and he rode well to push into the top five. The ‘#22’ is now seventh in the standings and 12 points from Gautier Paulin. After a busy couple of weeks that have involved two International meetings and trips to Qatar and Thailand, the factory team can now return to Lommel in Belgium and de-brief. The crates will need to be packed again however after a swift turnaround of material. The Grand Prix of Argentina is two weeks away but the long travel to South America means thoughts have to swiftly turn towards Neuquen. MXGP Moto2: 1. Antonio Cairoli (ITA, KTM), 29:10.216; 2. Clement Desalle (BEL, Rockstar Energy Suzuki), +0:09.756; 3. Ryan Villopoto (USA, Kawasaki), +0:22.788; 4. Romain Febvre (FRA, Yamaha), +0:51.327; 5. Kevin Strijbos (BEL, Rockstar Energy Suzuki), +0:59.278; 6. Gautier Paulin (FRA, Honda), +1:03.006; 7. Todd Waters (AUS, Husqvarna), +1:05.485; 8. Tyla Rattray (RSA, Kawasaki), +1:16.036; 9. Dean Ferris (AUS, Husqvarna), +1:18.208; 10. David Philippaerts (ITA, Yamaha), +1:19.321; 11. Maximilian Nagl (GER, Husqvarna), +1:22.915; 12. Evgeny Bobryshev (RUS, Honda), +1:28.771; 13. Glenn Coldenhoff (NED, Rockstar Energy Suzuki Europe), +1:44.164. MXGP Overall result: 1. Ryan Villopoto (USA, KAW), 45 points; 2. 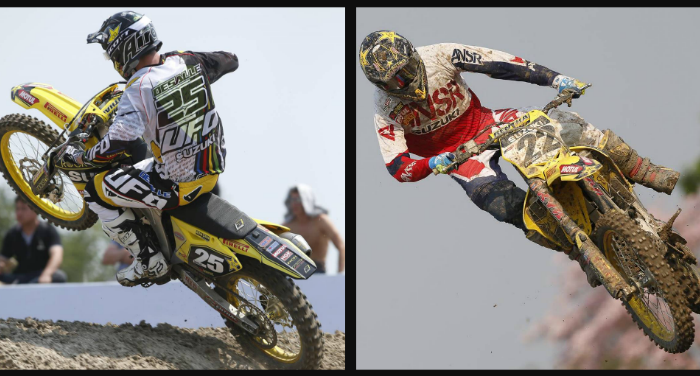 Clement Desalle (BEL, Rockstar Energy Suzuki), 44 p.; 3. Antonio Cairoli (ITA, KTM), 41 p.; 4. Romain Febvre (FRA, YAM), 38 p.; 5. Kevin Strijbos (BEL, Rockstar Energy Suzuki), 31 p.; 6. Gautier Paulin (FRA, HON), 29 p.; 7. Maximilian Nagl (GER, HUS), 28 p.; 8. Todd Waters (AUS, HUS), 26 p.; 9. Tyla Rattray (RSA, KAW), 26 p.; 10. David Philippaerts (ITA, YAM), 20 p.; 11. Evgeny Bobryshev (RUS, HON), 20 p.; 12. Shaun Simpson (GBR, KTM), 17 p.; 13. Dean Ferris (AUS, HUS), 13 p.; 14. Glenn Coldenhoff (NED, Rockstar Energy Suzuki Europe), 13 p.
MXGP Championship Standings (after 2 of 18 rounds): 1. Clement Desalle (BEL, Rockstar Energy Suzuki), 88 points; 2. Antonio Cairoli (ITA, KTM), 79 p.; 3. Maximilian Nagl (GER, HUS), 78 p.; 4. Ryan Villopoto (USA, KAW), 70 p.; 5. Romain Febvre (FRA, YAM), 67 p.; 6. Gautier Paulin (FRA, HON), 67 p.; 7. Kevin Strijbos (BEL, Rockstar Energy Suzuki), 55 p.; 8. Evgeny Bobryshev (RUS, HON), 45 p.; 9. Todd Waters (AUS, HUS), 40 p.; 10. Shaun Simpson (GBR, KTM), 38 p.; 11. Tyla Rattray (RSA, KAW), 35 p.; 12. Jeremy Van Horebeek (BEL, YAM), 32 p.; 13. David Philippaerts (ITA, YAM), 31 p.; 14. Davide Guarneri (ITA, TM), 28 p.; 15. Glenn Coldenhoff (NED, Rockstar Energy Suzuki Europe), 27 p.